Once again, Mario has a partner. In Super Mario Sunshine, it was the water-squirting and ever-annoying F.L.U.D.D. that helped Mario save Isle Delfino from pollution. 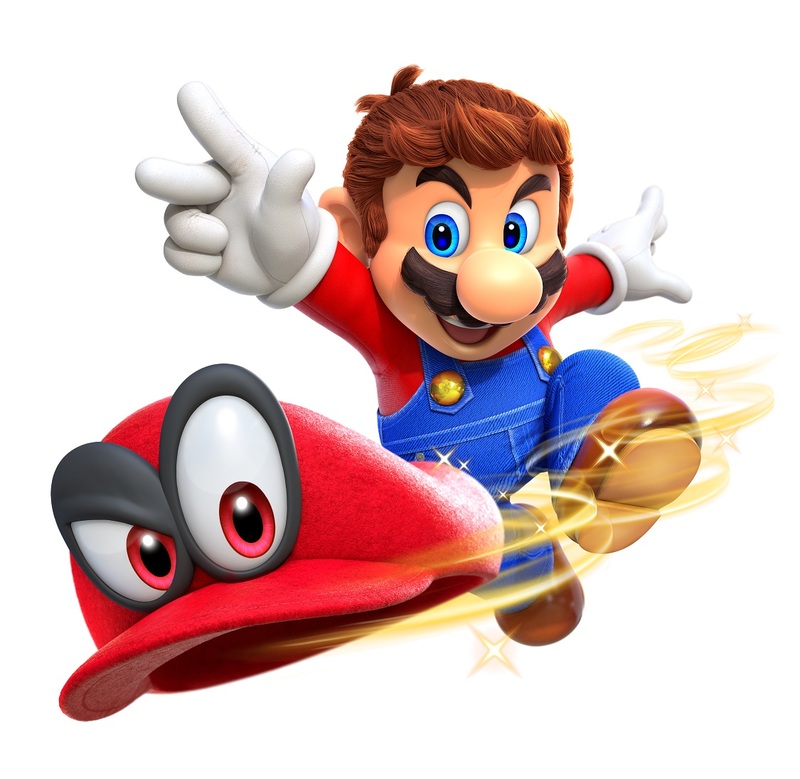 In Super Mario Odyssey, Mario is teaming up with…his hat…which is now named Cappy. And once again, Mario and his new partner must team up to save Princess Peach from Bowser, who is now coming at her with…wedding bells?! Pictured: Princess Peach in a wedding gown. 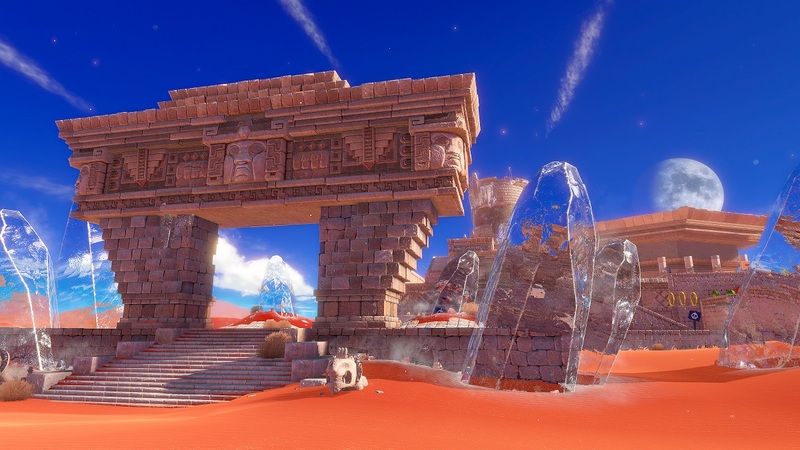 During a brief ten-minute demo, I chose to explore the Sand Kingdom (over the alternative New Donk City). 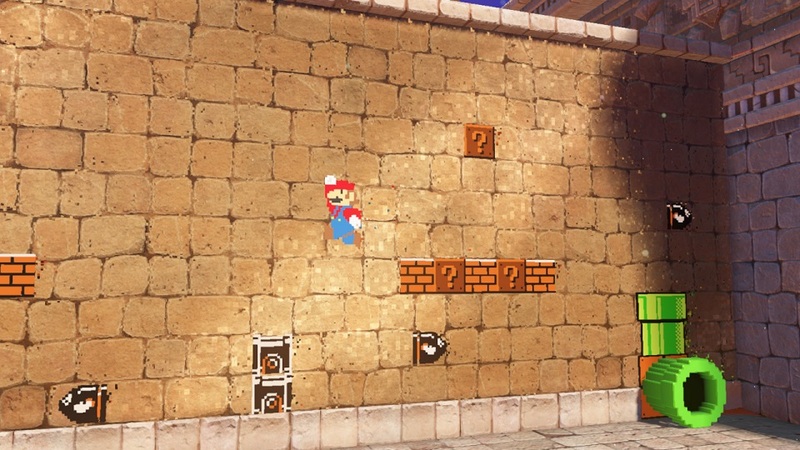 In a throwback to the Nintendo 64/Game Cube Mario games, Super Mario Odyssey takes place in sandbox worlds (called ‘kingdoms’ here) where Mario is tasked with collecting “Power Moons” (think Stars or Shines) throughout each area. The big difference between the latest Switch entry and those of Mario’s past is that the ‘kingdoms’ are smaller than prior game stages but the gameplay in each is more dense with plenty of platforming and enemies packed into a tighter area. The Power Moon collectibles themselves are plentiful and I kept coming across one every couple of minutes. These seem to be the type of collectible to foster a quick ‘play and collect’ when you only have a few minutes to spend with Mario, which fits in perfectly with the hybrid handheld/console concept of the Nintendo Switch. Welcome to the Sand Kingdom. Parts of it had apparently been frozen over. (Story is never the core Mario franchise’s strong point). When I first started my demo, I immediately reverted back to my old Mario habits of jumping on and stomping Goombas. After a gentle bit of guidance by the Nintendo representative, I waggled the right Joy-Con and watched Mario throw Cappy in the direction he was facing. If I held down a button, I could throw Cappy in a boomerang fashion. This quickly became my default mode of fighting enemies, and I stopped jumping on them. I also discovered that tossing Cappy was a clever way to collect coins at a distance or to trigger devices throughout the second part of the level that sent out destructive waves of energy. The throwing mechanic took almost no time at all to feel like it has always been a classic part of the Mario franchise. The platforming is classic Mario fare, and that is a good thing. During my demo, I wall jumped my way up to a higher level, navigated moving platforms, and jumped across quickly disappearing sand plumes. When it came to possessing enemies, I was only able to have time to possess various Bullet Bills and a statue with sunglasses. You can possess certain enemies for a limited time by throwing Cappy at the enemy you want to take over. The two forms I possessed played slightly differently and had different abilities. The Bullet Bill would let you go through the air (on a flat plane, you couldn’t go up and down) and you could press ‘Y’ to go faster. The sunglasses wearing statues, when you pressed the button, would let you see where invisible platforms were to cross an otherwise uncrossable pool to Mario. This adds another welcome level of depth to the standard platforming fare. Anyone or anything Mario possesses comes complete with a mustache and his trademark red hat. The biggest surprise, however, was that there were two places in the Sand Kingdom where Mario entered a green pipe and turned into his 1985 NES classic Super Mario Brothers sprite, complete with the retro graphics to match. During these segments, I squatted, ran, and and hit question mark blocks while dodging yet more Bullet Bills to get to the exit part. These sections (at least the two I encountered) were not the most challenging of Mario 2-D sections in the series history at all, but were a definite welcome entry to the Odyssey mix. 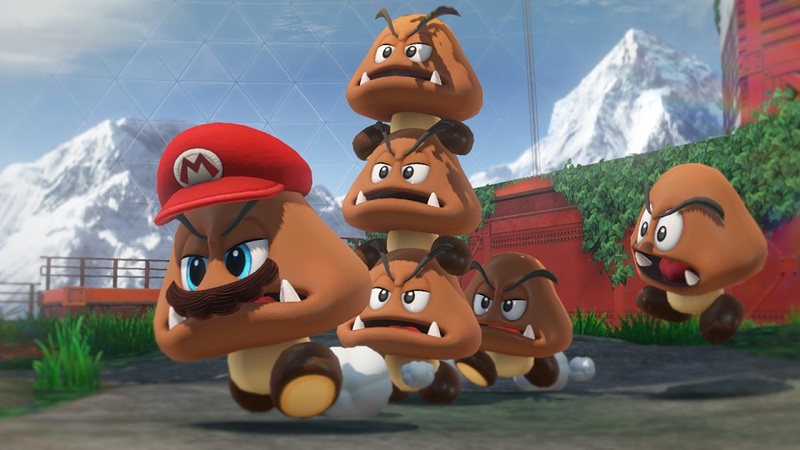 For the brief time I spent with Super Mario Odyssey, I had a lot of fun collecting Power Moons (when you collect one, it doesn’t kick you out of the level, so you’re encouraged to just collect as many as you can while going throughout the kingdoms). That being said, there were a couple things that I did not like. The biggest by far was that I was constantly having to adjust the camera using the right Joy-Con stick. The camera did not seem to be as ‘smart’ as I would have liked, and I was constantly adjusting it to make sure that I could see the proper depth needed to accurately platform. The other thing I did not like was that for all of the clever new additions and platforming, there was no way to make Mario run faster (instead he plods along at only one pace throughout the kingdom) like the ‘dash’ included in Super Mario 3D World, and the extra ‘spin’ jump of Super Mario Galaxy was unfortunately gone too. These two little things are quickly missed despite their near omnipresence in those prior titles. There is also a lot of weirdness in Super Mario Odyssey. (The green crescent moon is a Power Moon collectable). One final note: gold coin collecting is still a thing in Super Mario Odyssey, and that hasn’t changed here. However, each kingdom has is own special currency that you can use only at that particular kingdom’s shop to buy items and gear with. Unfortunately, the shop in Sand Kingdom was at the very beginning of the kingdom so I was unable to make any purchases. But it is clear that this is to promote the player to revisit levels over and over again in an attempt to buy all of the items available for sale (this is besides coming back to try to collect all of the Power Moons). Overall, I had a wonderful and delightful time playing Super Mario Odyssey at E3 2017, and I cannot wait for the final game to be released on October 27, 2017. All images are courtesy of Nintendo Co., Ltd.
What do you think? Are you planning on getting Super Mario Odyssey? Let us know in the comments below!